Posted Monday July 28th, 2014 by Spencer Mahar in Fun + Personal. I recently returned back from two great weekends of camping with my family right here in Connecticut. First, we ventured out to the Bear Creek Campground at Lake Compounce in Bristol. Camping has become our new family hobby and has brought us all closer… literally! 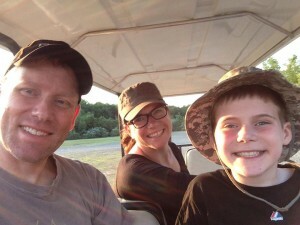 The three of us fit into a little travel trailer, but spent most of our time around the campfire anyhow. And just use the RV for sleeping and getting ready for the day. We also spent another great weekend at Rocky Neck State Park in Niantic. Our group played a great corn hole tournament and hit Rocky Neck beach. Our family had such a great time so close to home.